Today's Prompt: Theme Song. Imagine your health focus or blog is getting its own theme song. What would the lyrics be? What type of music would it be played to? Last night, Hubster had some work to catch up on, so I put the little ones to bed on my own. One in each arm, snuggling in our king sized bed, I began to sing The Second Star to the Right, a Disney lullaby that I love - and that my daughter loves. And I thought of this. 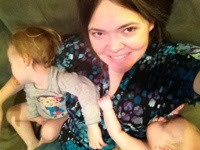 Recorded it this morning - in real life glory (aka no make-up, hair a mess, babies all over me). And let you know I care. Sweetie's favorite song, by far. This little blog I write. Really lovely... opened my heart. Thank you. Simply beautiful. Lovely voice, lovely lyrics, adorable children.